ATTLEBORO, Mass. – Heading into the third period of an early season game trailing by three goals, Attleboro could easily have gone through the motions for the final 15 minutes of Thursday night’s non-league Div. 3 game against Weston at the New England Sports Village. Instead, the Bombardiers came out flying and dominated the third period to create a remarkable ending. Attleboro came all the way back to tie it thanks to a pair of goals from senior Jake Parker and a shorthanded breakaway goal by junior Cam Littig with just 1:15 remaining, but Weston tacked on a power play goal 30 seconds later to pull out a thrilling 4-3 victory and hand the Bombardiers their second dramatic one-goal loss of the season. The first period was mostly uneventful with both teams held to just five shots on goal apiece. 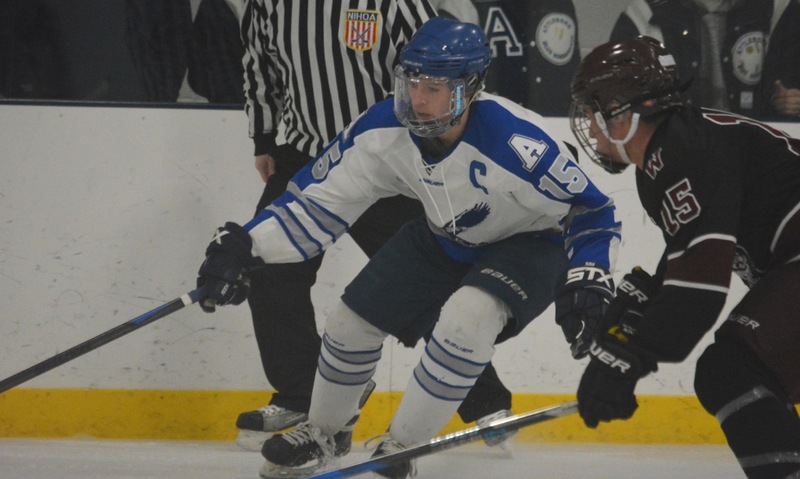 The Bombardiers’ depleted defensive unit, senior Ed Noel, junior Kyle McCabe, and sophomore Sam Flynn, were pushed by the Wildcats, who had plenty of zone time in the period, but clogged shooting lanes and limited the looks on goalie Evan Andrews. In the second period, Attleboro found its groove on offense, but it was Weston that found the back of the net. The Bombardiers held an 11-4 edge in shots in the second, but the Wildcats scored three times on their four shots. Thomas Burke had the opening goal with 11:15 left in the period on a one-timer from the slot after a perfect pass by Cooper Griffin, who scored a pair of goals and assisted on Weston’s two other scores. With 5:30 left in the second Griffin got on the board with a power play goal off a Burke assist and then added another with 26.2 on the clock after a defensive mistake allowed him to skate free into the zone down the right wing. Attleboro had more than its fair share of scoring opportunities in the period. Freshman Aidan Diggin had the first chance with a backhand after beating his marker on the left circle but sophomore Zack Korbin (32 saves) made the stop. Diggin had another chance a few minutes later off a Ryan Morry pass but the one-timer was knocked aside. Littig also saw a one-timer from the slot, set up by good work around the crease by Liam McDonough, miss just wide of the post. The third period was a continuation of the second, as Attleboro was on the offensive from the start. The Bombardiers would hold a 19-6 advantage in shots in the period and 35-15 for the game. McDonough hit a one-timer into the chest of Korbin early in the period, but then went to the box for a holding call. Down a skater, Attleboro had a clean breakaway when Diggin jumped the play at the blue line and stole the puck, but Korbin stood tall to deny the chance. Another penalty extended the Weston power play but again Attleboro’s shorthanded unit created offense. Parker this time stepped up to make the defensive play and get free behind the Weston defensemen. He was hauled down just as he was lining up his shot and was given a penalty shot. The team’s leading scorer faked forehand and roofed his backhand to get Attleboro on the board with 9:04 to play. The Bombardiers went on the power play a minute later and 20 seconds into the man advantage nearly cut the lead to one. Parker’s shot from the point through traffic was kicked aside at the last second by Korbin, who then managed to get a blocker to Littig’s rebound effort. Two minutes later, Parker struck the post trying to pick the top corner off a face-off win. As time was winding down and it seemed like the Bombardiers’ effort would get them no closer, Parker went one-on-three against the Weston defense. He dropped his shoulder and managed to split a pair of players and again went top shelf with a backhand to cut the lead to 3-2 with 2:09 left. Parker was called for a controversial penalty with 1:24 left that left the Attleboro bench furious and the Bombardiers without their best player on the ice for the remainder of the game. Again Attleboro did not give up. Weston won the face-off in the attacking zone, but Littig beat the defense to the puck on the blue line and he scored his breakaway chance to tie the game. Thirty seconds later and the excitement in the rink was subdued by a Weston winner. Griffin fired a shot from the left circle that Andrews could only parry and Michael Sacco was stationed on the back post to tap the rebound into an empty net. Littig nearly answered back just a few seconds later, but the Wildcats managed to clear the puck and claim the two points. Attleboro (3-2) will not play again until Jan. 6 when the Bombardiers are on the road to open Hockomock League play against Foxboro.